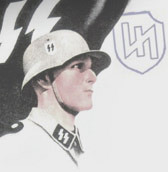 The following sites are a good resource for research and history of the 2nd SS "Das Reich"
Lexikon der Wehrmacht Great German site for all kinds of information: Soldbuch, Landser slang, etc. Unfortunately, no English translation. The following sites are recommended for items to complete your impression. As always, be sure to check with a unit commander before purchasing! The homepage of our organization, the "Army Group 1944"